Gum Disease - body, causes, What Is Gum Disease? Gum disease is an infection caused by bacteria that affect the tissues surrounding and supporting the teeth. Like getting gray hair and wrinkles, losing teeth once seemed to be an inevitable part of growing old. The number one cause of tooth loss in adults is still gum disease, also known as periodontal (per-ee-o-DON-tel) disease. This is an infection caused by bacteria that affect the tissues surrounding and supporting the teeth. About three out of four adults over age 35 have some type of gum disease. However, tooth loss does not occur until the disease is advanced. It often can be prevented by taking good care of the teeth and gums and seeing a dentist regularly. Gum disease causes the gums to become red, swollen, and inflamed. Compare the healthy gums on the left to the diseased gums on the right. Long-term gum disease causes the gums to pull away from the teeth. Biophoto Associates/Science Source, Photo Researchers, Inc.
bone that supports the teeth can be badly damaged. The teeth may become loose and fall out, or they may have to be pulled by a dentist. Gum disease is caused by plaque, a sticky film on the teeth made by bacteria that live in the mouth. If plaque is not removed each day by brushing and flossing, it hardens into a rough substance called calculus, also known as tartar. The bacteria in plaque produce chemicals that irritate the gums and cause infection. If left in place, these chemicals cause the gums to pull away from the teeth and create little pockets of space between the teeth and the gums. As the infection gets worse, the pockets get deeper. The result may be the destruction of the bones in the jaw that hold the teeth in place. Most adults over age 35 have some degree of gum disease. People who smoke or use chewing tobacco, have uncontrolled diabetes, eat poorly, or have too much stress are all at greater risk for developing gum disease. Female hormones can play a part as well; girls who are going through puberty and pregnant women also are at risk. What Happens When People Have Gum Disease? A dentist can check the gums for signs of disease. In addition to looking at them, the dentist can use a probe with a special rounded tip. This probe is moved gently around the gum line to search for pockets in the gums. Treatment depends on the type of gum disease and how far along it is. Cleaning the tooth surface and the root below the gum line helps the gum tissue heal and reattach to the tooth surfaces. Antibiotics can help control the growth of bacteria. If the pockets are too deep to clean inside, the dentist may need to perform surgery to shrink the pockets. If part of the bone supporting the teeth has been destroyed, further surgery may be needed. Such surgery can reshape or rebuild the bone that has been lost. Picking a brush that feels comfortable and will reach all the teeth, even those in back. Replacing the brush when the bristles show signs of wear. Brushing with a short, gentle, back-and-forth motion. Remembering to brush the inside surfaces, the back teeth, and the tongue. Flossing to reach plaque between the teeth and under the gum line, where a brush cannot go. It also is important to see a dentist regularly for checkups and professional cleanings. American Dental Association, 211 East Chicago Avenue, Chicago, IL 60611. The leading national organization for dentists has information about gum disease and dental care on its website. U.S. National Institute of Dental and Craniofacial Research, 31 Center Drive, MSC 2290, Bethesda, MD 20892-2290. Part of the U.S. National Institutes of Health (NIH), this agency publishes brochures and posts fact sheets at its website about gum disease and mouth care. 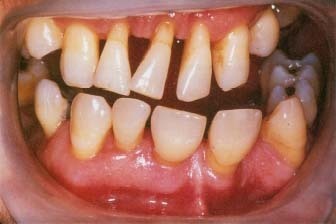 Your long term gum disease picture is upside down.